I know, I promised fashion week coverage. Sorry! I’m still sorting through all 400 pics, so have a manicure look instead. For the most part, last week’s manis consisted of all of the nail decals I could find. As much moving, snapping pictures, changing, and running out the door I was doing, regular polish just wasn’t as feasible as I’d hoped. This week, however, I am back to the day job and my usual grind. Why not break out the regular polish? Now, most of the time my fingers and toes do not match in color or design. 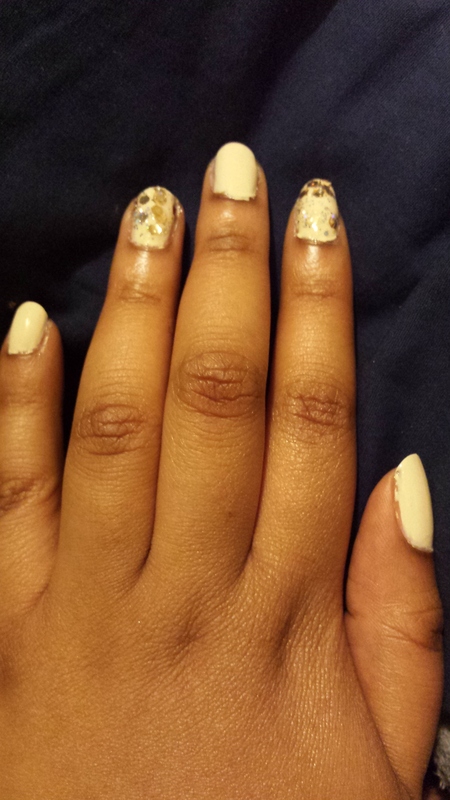 Last week, when my nails weren’t bare, they had simple one or two toned looks (reverse mani stickers and such). My toes, however, were decked out with rhinestones in flower shapes and polka dots. 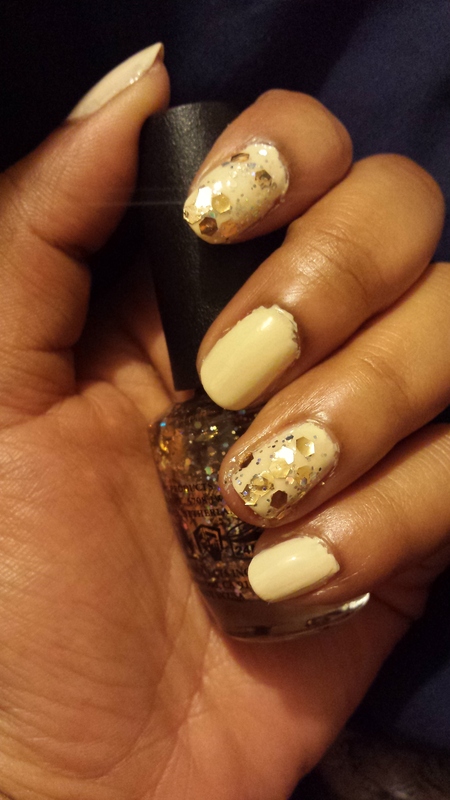 For last Saturday’s fashion show, I decided to change to a pale cream shade and add some gold glitter. I couldn’t decide what to wear, and I’d knocked the rhinestones off of one toe, so I figured it would be a good neutral bet. These are colors you’ve seen me do before. I have no idea what the name of the cream color is there (it’s by Julep, but the sticker fell off!) and the gold glitter is OPI’s I Reached My Gold. My outfits were elaborate enough last week that I am actually looking forward to being a bit understated this week.